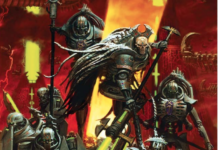 Welcome to Best Warhammer 40K Lists, where we take a look at three lists for a given faction and break down what makes them tick and how they fared. Every entry will be pulled from a recent GT, and we’ll be going over everything from who played the army to how likely the army in question is likely to continue to perform as the game evolves. 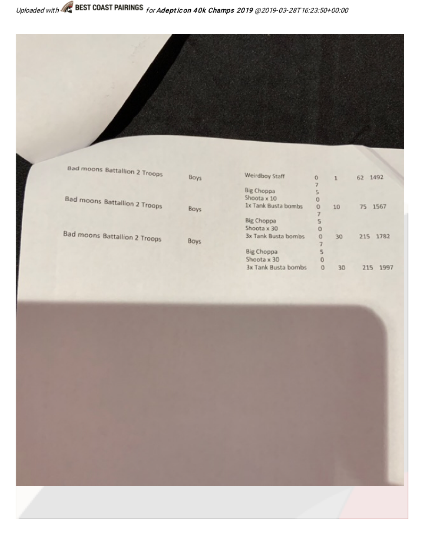 Today, we’re going to be looking at the top 3 placing lists from Adepticon, instead of looking at a single faction. 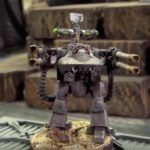 Adepticon is one of the largest gaming events in the United States of America, and it’s worth checking out if you can make your way to Schaumberg, Illinois. 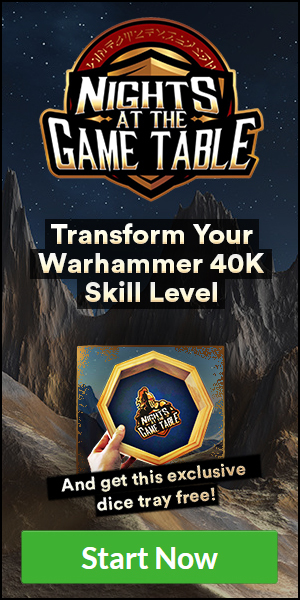 This year’s 40K event had 258 players duking it out, and we’re going to be looking at the main prize finishers. Starting us off is Jim Vesal, who took 1st place with Chaos Demons. His list is very straight forward, but it’s brutally efficient and it’s piloted by an excellent player. Let’s take a look! 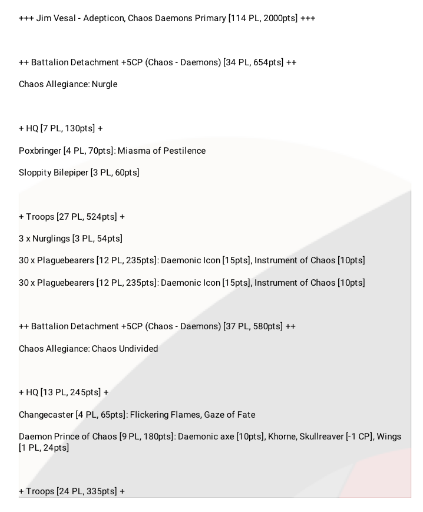 He took two Chaos Demons Battalion and a Thousand Sons Supreme Command for a total of 14 CP. His first Battalion is very stock, as it simply has a Poxbringer and Sloppity Bilepiper to support 60 Plaguebearers that clog up the middle of the board along with some Nurglings for objectives play. Interestingly, he doesn’t have a Spoilpox Scrivener to further improve his Poxwalkers. The rest of his list is far less stock, and we have some things to unpack. His second Battalion has a Changecaster and a Khorne DP with Axe. The DP takes the Skullreaver Relic which turns him into a one man wrecking crew. On the charge, he makes 6 Strength 11 AP-4 Damage D6 attacks that hit on 2+, re-rolling 1’s. On a Wound roll of 6+, he causes D3 Mortals. Finally, he gets to re-roll to wound against TITANIC units. This guy can bring the pain to almost any unit in the game except for huge horde units, and he typically 1 shots an Imperial Knight. The times he falls short, he’s only slightly short of killing a Knight. We also have a Changecaster as a support piece for some Pink Horrors. The Changecaster buys a free re-roll a turn through Gaze of Fate and gives the Pink Horrors +1 to Wound. In addition, he improves the Strength of the Pink Horrors from 3 to 4, which again shifts their success rates on rolling to wound up a stage against most targets. The Pink Horrors drop in with the Changecaster and vomit a disgusting 75 Strength 4 Ap0 D1 shots at +1 to wound. Sure, they’re only BS4+, but you’re still going to get around 35-40 hits. Thats a lot of saves to force onto a unit. Finally, he has a small Bloodletter Bomb. The 15 Bloodletters also deepstrike down and charge in with a 3d6 charge thanks to their banner and the Banner of Rage stratagem. They then fly in with 30 attacks and put the hurt on something. Finally, he has 10 Brimstones to take another objective or screen for his Thousand Sons. Speaking of, this moves us straight to the Thousand Sons. 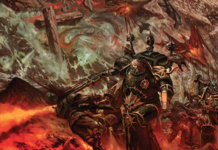 He took a Supreme Command with Ahriman, two Demon Princes, an Exalted Sorcerer, and a Contemptor. The various Psykers are really just there to dump an ungodly amount of Mortal Wounds. 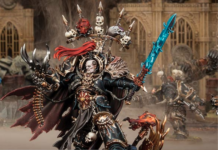 Across all of his casters he has 4 Smite casts that always go off on a 5(Thousand Sons don’t have to deal with Smite getting progressively harder to mainifest) along with 4 other powers that cause Mortal Wounds. 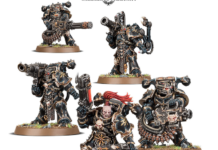 These 4 models can easily dump somewhere around 15-20 Mortal Wounds a turn out while also providing some other psychic support. 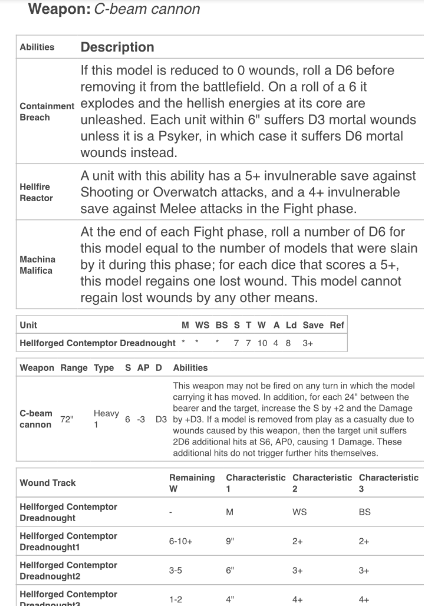 As if that enough, the Demon Princes are also solid melee threats, since they have a 4+ Invulnerable Save and each make 7 Strength 7 AP-2 Damage 2 Swings. Finally, we have a C-Beam Contemptor Dreadnought. This is easily the most exotic piece of tech in Jim’s list., as C-Beam Cannons aren’t a very popular option. The Contemptor sits way in the backfield so it can improve it’s profile, realistically reaching Strength 10, AP-3, Damage 3d3 on each shot. Each kill then inflicts 2d6 Strength 6 auto hits onto the unit. This guy can seriously threaten vehicles and hordes at the same time, and he’s dirt cheap at only 148 points. He makes an excellent finish to Jim’s list, as it gives him some consistent long range threat that can be very difficult to address with everything else going on. 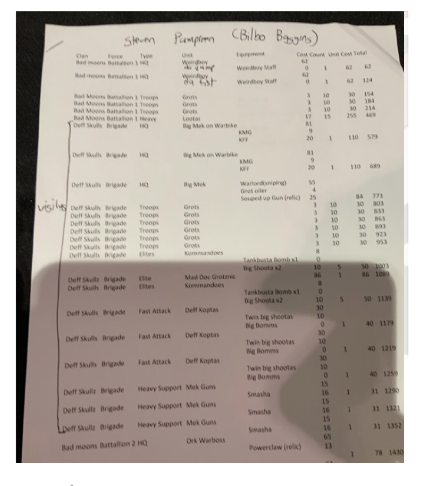 Jim’s list really doesn’t have any fat on it. It’s a very powerful mixture of many of the best tools that Demons and Thousand Sons have in one list, and all of it’s hammers are useful against a variety of targets. This makes the list extremely adaptive and flexible. Coupled with an obviously talented pilot and it’s no wonder this list took 1st place. Let’s move right along to our second place finisher, of Stephen Fore. He was playing Genestealer Cults, which is very impressive given how fresh that codex is. Let’s take a look at what he brought to the table! This is a rather interesting list for GSC, as it has an unusually high amount of shooting in it. It comprises of a Cult Of The Four Armed Emperor Battalion along with a mixed Brigade. His Battalion is very straight forward and efficient. He has an Iconward and a Primus to help buff his 3 Acolyte Warrior Bombs. With the Deliverance Broodsurge, a Clamvus, and the trait from being Cult Of The Four Armed Emperor, you’re looking at only needing a 7” charge out of reserves with the ability to re-roll it. Those bombs are pretty much all making it in. Interestingly, he also took a unit of Hybrid Metamorphs. They’re a tad pricey for how incredibly paper they are, but when they’re coming in along with 3 other units that all look to get dug into the enemy’s face on turn one, it’s not that big a deal. Offensively, each Metamorph has 3 Strength 4 Ap-1 attacks that can become AP-4, and an extra basic Strength 4 AP0 swing with +1 to hit. This Battalion just brings a total blender of of melee threats that rush in right away, which is what GSC should be doing. His Brigade actually has some pretty interesting tech. On the HQ side of things, he took a Patriarch, Magus, and a Jackal Alphus actually. There’s a few things to unpack here. First, along with the Clamvus and the Iconward, the Patriarch can use Mental Onslaught to delete troublesome targets right off the map. It’s a complicated set up, but you can read more about that here: (this would be a good plug IMO for the GSC tactics article I put up Dakota). He also took Alien Majesty for his Warlord Trait, which is normally a rather lackluster ability. However, with this many huge units roaming around, the bonus 3” for the Patriarch’s fearless aura is actually somewhat important, especially when you have all your units charging up the board. GSC have no way to combat morale outside of a Patriarch, and they are very vulnerable to it since they take huge units. This makes the selection of Alien Majesty in lists like this a more feasible choice. He also has a Jackal Alphus which combos with some other things in the list, which we’ll cover later. 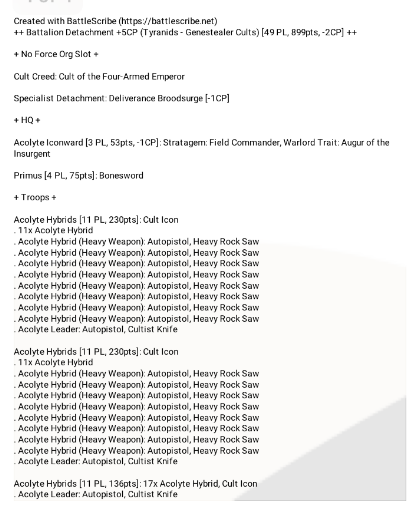 As far as the troops in the brigade go, he has 4 basic 5 man Acolyte Squads and 2 10 Man Brood Brothers Squads. These units just take objectives mostly, and obviously help fill out the Brigade requirements. His Elite choices are also fairly stock. He has a second Clamvus to help set up more of his charges, a Kelermorph to slaughter enemy characters (or anything else, really), and a Nexos for plenty of CP regeneration. His Heavy Support selections are also very stock as well, as he just has 3X3 units of Mortars. Mortars have great range, don’t require line of sight, and they’re dirt cheap. Over the course of a game, it’s very easy for Mortars to make their points back and then some, which makes them an obvious inclusion. His Fast Attack selections have some synergy and tech going on, however. He has 3 units of Atalan Jackals. Two of the Jackal units are super basic, as they clock in at 4 mans with basic equipment. It’s the third unit where things get interesting. He has a full unit of 10 Jackals with 2 Wolf Quads. The 10 Jackals each have a Demo Charge, and the Wolf Quads have Incinerators. This opens up a crazy wombo combo with the Jackal Alphus. The Alphus marks a target which gives the Bikes +1 to hit as long as they shoot at the unit that the Alphus marks. In addition, the Alphus broadcasts this +1 to hit within 12” for BIKER units, which helps with keeping in range. This giant unit of Bikes comes onto the table with Cult Ambush, and they use Lying In Wait to show up right in the enemy’s face. They then use A Perfect Ambush to shoot in the movement phase, and finally they use Extra Explosives to allow 5 of the 10 Jackals to all throw demo charges. That’s 5D6 Demo Charge shots coming in. The 5 Jackals that don’t throw demo charges shoot their shotguns, and the Wolfquads can shoot their Shotguns and Incinerators. Then in the following shooting phase, the 5 Jackals that shot their shotguns and the 5 that throw charges flip flop. Extra Explosives lets the other 5 Jackals throw their charges, and the Jackals that already threw their charges shoot their shotguns. When you couple this altogether, you get some seriously accurate and damaging firepower coming in from reserves. Except for the Jackal Alphus combo Stephen was running, his list was fairly stock. However, this just goes to show the raw overall power that Genestealer Cults bring to the table. 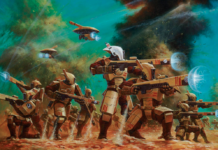 They have more reserves based combo’s and play than any other army by a huge margin, and capable players can really leverage that to put up some impressive results on the tabletop. Finally, we have Stephen Pumpreen who took 3rd Place with his Orks. Let’s see what he brought to the table. Steven took two Bad Moon’s Battalions and a Deff Skullz Brigade. His first Battalion is very simple. He has two Weirdboys for Psychic Support, some Grots to use Grot Shields with, and a big unit of Lootas. Lootas can double fire thanks to Showin Off, and with Moar Dakka+the Bad Moons trait of re-rolling 1’s to hit in shooting, you can really lay down the hurt across the board with these Bad Moons Lootas. His other Bad Moons Battalion has a Warboss with Da Killa Klaw and a third Weirdboy along with 70 Shoota Boyz and some Tankbustas. Da Killa Klaw is one of the strongest melee relics in the game, and with the psychic support he has his Warboss can really lay down the pain on a burly unit or target. His Brigade is where the army starts to get fancy. For starters, it’s a Dread Waagh! detachment which unlocks Da Souped Up Shokka for his Big Mek. This is a 2D6 Strength 2D6 Ap-5 Damage D6 weapon. Although it’s extraordinarily random, the average on this weapon is very high. Plus, he can shoot it twice with the Kustom Ammo Stratagem. He also has two more Big Meks with Kustom Mega Blasta’s and Kustom Force Fields, just to help support the army and bring some more Dakka. These weapons also synergize nicely with the Deff Skullz trait to re-roll 1 hit, wound, and damage dice per unit. His troop choices are fairly standard. He already has plenty of Boyz, so instead he takes 60 Grots. Grots are dirt cheap, they can body block bullets for other units thanks to Grot Shields, and they’re super easy to hide since they’re so short. For his Elites he has two units of Kommandos and Mad Dok Grotsnic. Kommandos can steal objectives thanks to their abilities and the Deff Skulls trait of giving any Infantry unit the super scoring ability that Troops units get for being in a Battle Forged army.The Mad Dok is a bit more durable and more accurate in melee compared to a Painboy, at the cost of occasionally trying to run off and charge enemy units when you don’t want him to. His Heavy Supports are fairly bare bones, as they’re simply one Mek Gun each. He took Smashas, which are decent at crunching larger targets from a distance. Finally we have his Fast Attack selections which comprise of 1 Deff Kopta each. Deff Koptas can fly across the board and drop a bomb on an infantry unit for a few easy mortal wounds, while also providing some light anti infantry firepower. They’re also okay in melee, as they make 2D3 Strength 5 AP0 D1 attacks each. That’s just enough to slowly grind out a backfield unit or two. 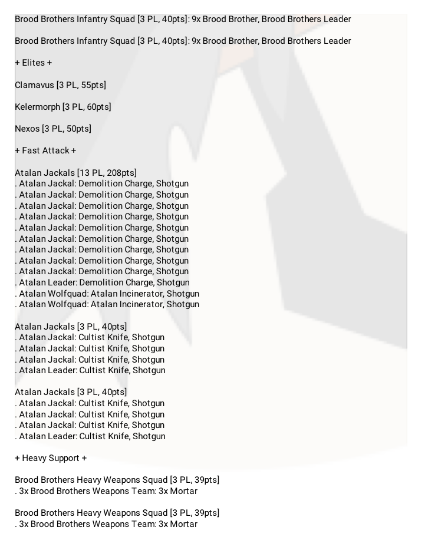 Stephen’s list is very shooty for an Ork list, but that just goes to show how flexible the Ork codex is. He has lots of bullets thanks to his Lootas and Shoota Boyz, and lots of anti-tank thanks to his Lootas, Smasha Guns, and Da Souped Up Shokka. The Lootas really are one of the all stars in this list, as they can get Da Jumped to safely re-position and their firepower is extremely flexible. He also has excellent objective play between the hundreds of bodies he has and Kommandos showing up and taking Objectives you thought were secure. He also has some disruptive elements, as Deff Koptas are very fast and they can easily get in the way of your opponent. Interestingly, It’s also a list that’s somewhat hard to properly move against. It has a lot of shooting, which makes you want to come to it. But, it can also threaten to Da Jump a bunch of Boyz in your face if you leave a hole in your backfield. This makes it hard to really engage with properly for many lists. That wraps us up for today! 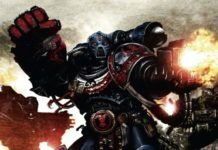 Adepticon is one of the biggest 40k events, and it’s important for anyone trying to follow the meta to pay attention to. 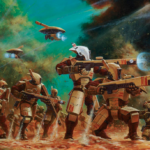 We’ll be looking at some Adepticon performances for various factions over the next few weeks to help keep you all up to date with what the best players are playing. A big thanks to Games workshop for the images used in this article.